Peacefulness, and Privacy! Lot 148 has it all with extensive landscaping and pavers. Step out of your coach to multiple seating areas and a swing to enjoy the open space. Here you'll have an incredible view of the mountains and lake to entertain your friends. 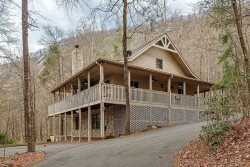 This lot also has a PRIVATE deck suspended out the front of the lot with spectacular views of the mountains, water wheel, lake and club house! Come and enjoy lot 148 and all that Apple Valley Farm and Rumbling Bald Resort has to offer! Rented golf carts can not be taken to this Lot. It was a wonderful way to spend a weekend. We will be returning. We walked the entire property and really like 148.